Edith Cowan University is committed to promoting an inclusive and supportive workplace culture where staff and students feel comfortable and safe to bring their whole selves to the work and study environment. The Diversity Development Framework is a multi-modal, multi-layered framework that facilitates an equitable approach to staff development in all areas of diversity. 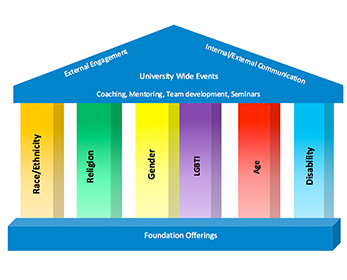 Foundation offerings cover concepts such as: the state and federal government requirements around equal employment opportunities; bias (conscious and unconscious); the dominant paradigm in Western Culture; and key areas of diversity: race, ethnicity and cultural heritage; gender; age; disability; religion; sexual orientation, and gender identity or intersex status. Subsequent sessions are focussed in six identified areas of diversity representative of the staff and student cohort at ECU. Sessions offered in each pillar are scaffolded to establish awareness, increase knowledge and develop intrapersonal and interpersonal skills when working with both staff and students. Each of these sessions will build on the foundation understanding and is supported by University wide initiatives and community events. This proactive approach will put ECU on the leading edge of diversity awareness and inclusion. This model has the potential to increase the reputation of ECU as well as enhance organisational reputation; and maintain a competitive advantage. Offerings in each pillar are scaffolded to provide a growing understanding and increase in depth. Three levels have been identified as: Awareness; Knowledge; and Skills. Awareness level sessions in each pillar offer an introduction into that area of diversity; the challenges faced by this group, the common stereotypes and misconceptions, the terminology and language associated with this group. These sessions are designed as a safe space for staff to explore an area that may be new to them as well as discuss questions. Examine how personal beliefs and behaviours affect students, colleagues, and interpersonal interactions in a multicultural environment. Understand the challenges faced by individuals in each group and how these may be present in the workplace. Explore the significance of their background, culture, and unique experiences in defining their identity and expectations. Examine their attitudes, experiences, and decision-making processes as they relate to diversity. The EEO online modules, provide staff with a grounding around the legal aspects of diversity and discrimination with a focus on the university context. The interactive face to face Managing Unconscious Bias workshop provides participants with the opportunity to self-assess their own unconscious bias and consider where and how to reduce the negative impact of unconscious bias. ECU has a multigenerational population of staff and students. Research shows that diverse teams can access a deeper and wider knowledge bank, leveraging this to generate new ideas, products and creative solutions, and ECU is committed to ensuring all staff, be they baby boomers, gen X or Y or millennials, have the opportunity to contribute. As a newly identified area of diversity, the Organisation Development team in HR is beginning the foundation for staff development sessions in this area. Australia has been multi-faith for more than 50,000 years, given the diversity of beliefs and practices among Aboriginal and Torres Strait Islander peoples. Anglicans, Catholics, Methodists, Congregationalists, Presbyterians, Jews, Muslims, Atheists, Agnostics and many other religious groups have been arriving in Australia since colonisation in 1788. In recognition of this, ECU is committed to encouraging religious acceptance and avoid stereotyping or discrimination. Facilities for spiritual service and prayer have been provided at Joondalup and Mount Lawley for staff and students of any faith http://intranet.ecu.edu.au/student/campus-life/campus-facilities/multifaith-centre/about and the Organisation Development team is HR is beginning the foundation for staff development sessions in this area.